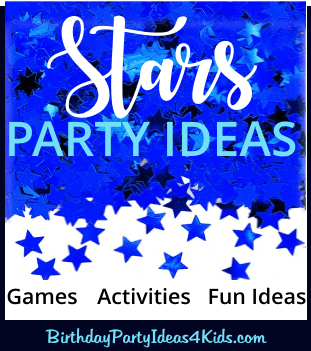 Reach for the Stars with these fun do-it-yourself birthday party ideas. The theme runs throughout all of the ideas including invitations, decorations, games, activities, party food and favors. On blank black note cards use a star shaped hole punch to punch stars from the front of the card. Include the punches as confetti in the invitation. Silver or gold cards in star shapes. Buy them or make from cardstock or construction paper. Embellish with glitter. Buy postcards or print out pictures of star formations / galaxies and write party information on the opposite side. Place blue, silver or white helium balloons on the mailbox and add a few star shaped balloons in the mix to tell guests where to find the birthday party. Hang cardboard stars in varying sizes from trees in the front of the party area. 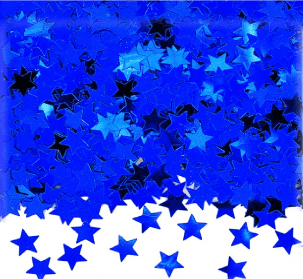 Cut out cardboard stars from construction paper or poster board and tape to the sidewalk leading up to the party. Light up the evening sky with white strings of lights inside and outside. If the party will be held in the evening hang plastic glow in the dark stars around the front entrance and all throughout the party area. Decorate the party table with a dark blue or black tablecloth and sprinkle silver star shaped glitter down the center of the table. Hang silver and/or gold metallic stars from the ceiling of the party area. Drape strings of white lights around the party area and the food table. Make a backdrop by gluing silver stars to curling ribbon about 4" apart and then hanging the strings side by side from the ceiling. Set up a campfire outside and use it to roast marshmallows, hotdogs and make Smore's. Set up lawn chairs in a circle around the fire and star gaze, tell stories and sing campfire songs. You can also make a pretend fire inside using red and orange construction or butcher block paper for the flames and real logs. For star gazing inside use a constellation viewer that creates the constellations on the ceiling. Make or buy a star shaped Piñata. Have small bags available for the kids to pick up the candy and toys that drop. Set up instructions and tips for a party Piñata. Play this game at night when it is dark. Choose a person to be "it" and give them a flashlight. They close their eyes and count to 100 while everyone else hides. The child with the flashlight then searches for the hidden players. When the person who is it finds a hidden player they must shine the flashlight on them and call out their name. After this point there are several variations in how to play. 1. The child with the flashlight gives the found child the flashlight and they before the new "it". 2. The child who was found has to go to a designated spot and stay there until the game is over or he/she is tagged out by another child who is hiding. 3. The children who are tagged stay with "it" and help find the rest of the players. You can give out extra flashlights or just use one. The person who is tagged first becomes the new "it" for the next round. Cut out items such as brownies, cookies, sandwiches, fruit or Rice Krispie treats using a star shaped cookie cutter. Star shaped pasta is fun with several different sauces that the kids can choose from. Cut hamburger meat into star shapes and have a cookout.